1. Halve any larger potatoes and cook in a pan of boiling water with the turmeric for 8 minutes until tender, then drain well. 2. Meanwhile, cut the chicken into long strips, thinly slice the red onion and ﬁnely chop the deseeded chillies. 3. 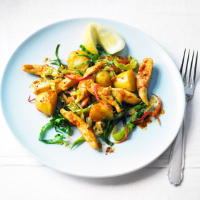 Heat the oil in a wok and cook the chicken, red onion and chillies for 5-8 minutes. Halve then shred the cabbage. Add the cumin seeds, curry paste and drained potatoes to the pan and cook for 1 minute. 4. Add the shredded cabbage and a splash of water and cook for 3-5 minutes until the cabbage is tender and the chicken cooked through.